Dr Stephen Ladyman (below), former British MP and minister of state for transport gives his perspective on the challenges facing governments in maintaining roads, reducing emissions and securing funding. I was taught that work tasks can be divided into two categories. Most of your time will be spent on ‘Maintenance Tasks’. These are the things in our job description that we have to do and do well because that is what is expected of us. However, a small part of your time should also be spent on ‘Promotion Tasks’. These are the things that make our colleagues sit up and take notice of our performance – tasks we weren’t expected to take on, risks we have taken, the innovations we introduce, or the jobs we brought a new way of thinking to. Governments are just the same. There are policy areas that are akin to Maintenance Tasks, that have to be done and done reasonably well or people complain, but these policy areas won’t influence the next election. Promotion Tasks are the things that can win or lose the election. In recent years, in the UK, these have been tax, the economy, and the NHS. Transport is very firmly in the ‘Maintenance Task’ bracket for government. That’s not to say it gets ignored – far from it – it just doesn’t attract disproportionate amounts of resource or strategic risk taking, and national transport priorities are unlikely to change dramatically over time. Broadly speaking, government has three road transport priorities which have been constant for 20 years, namely: Safety; Climate Change; and Congestion. A fourth priority, Business and Technical Innovation, is rising up the agenda. Safety has been a priority for many years and that’s unlikely to change. Up to the end of September 2015 there had been 1780 road deaths in Great Britain and 23,780 people killed or seriously injured. We have as good a record as any other country in the world, but if any other area of national activity caused that level of carnage it simply would not be accepted. Historically, the key tools for addressing road safety have been high standards of road engineering, speed enforcement, and the ‘Think!’ campaign. All three are likely to continue to some extent. However, statistics continue to show a worrying increase in cyclist casualties and it is in this area that priorities may change as government and local authorities target engineering projects at protecting cyclists. 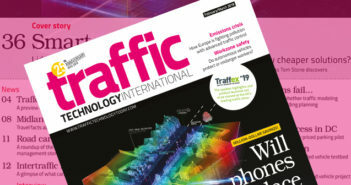 Wider use of cycle detection and cycle prioritisation at traffic lights, using solutions such as Clearview’s M100BR Bicycle Radar Detector, and better delineation of cycle paths with SolarLite Active Road Studs can form part of the package to tackle cycle safety. Climate Change came onto the agenda in 2008 when the Climate Change Act came into force. Currently about a third of the UK’s CO2 emissions come from transport. Sir David King, the UK’s Special Representative for Climate Change, has said that by 2050 every road vehicle will need to be powered from the grid and stringent targets for new car emissions by 2020/1 will mean manufacturers will want to drive many road users towards electric vehicles. This inevitably will mean far more charging points wherever vehicles park, for work, retail or leisure, as well as in motorway services. Bay occupancy systems, such as Clearview’s M300, can help highways departments to ensure charging points are not blocked by non-users. Congestion is another continuing priority for Government. The estimated cost of congestion to the UK economy is in the billions and expected to continue to rise rapidly according to statistics from INRIX and CEBR, increasing to £21bn a year by 2030. Congestion is also a major cause of carbon emissions as slow moving or erratically moving vehicles are the least efficient and most polluting. Historical solutions, for example, new road building, are either expensive, ineffective or difficult to deliver. More recent approaches, such as managed motorways have been highly successful and cost-effective. It’s likely that they will be rolled out until every motorway with a congestion problem is a managed motorway. Smart mobility will also help to ease congestion by enabling road operators to monitor and manage urban traffic flows, to provide road users with easily digestible, real time information, and to prioritise certain types of road users to encourage sustainable transport options. Integrating smart parking solutions and linking to VMS means that drivers can be directed immediately to an empty parking space, rather than having to circle around looking for a space. Business and Technical Innovation is rising up the agenda as the fourth government road transport priority. Estimates suggest that the fast-growing intelligent mobility market will be worth £900 billion per year globally by 2025. Of course, all governments have used transport spend to support British industry, but the introduction of the Transport Catapult has given new energy and focus in this area. Whether the driverless car will address a real need is open to question, but it’s clear that connected autonomous vehicles will become commonplace on our roads and the Government is keen to see British industry leading the way. Unfortunately, it is in this area that Brexit might have an adverse impact. In terms of FP7 funding awarded on a competitive basis in the period 2007 – 2013, the UK was the second largest recipient, securing €6.9bn. Based on the UK getting the same proportion from Horizon 2020 funding, we would have expected to be on track to receive €12bn. Of this, it was anticipated that some €1bn would be directed to UK research that met the ‘Smart, Green and Integrated Transport’ criteria. In August, the Government pledged to underwrite existing grants when projects continue post-Brexit, but critics point out that there is no pledge of extra funds beyond those projects to which we’re already committed. It will be critical that the UK Government continues to support domestic transport innovation after we leave the EU in order to maintain our world class R&D base and to retain our resident expertise and skills.